Do You Need Swift Delivery of Emergency Refrigeration? A refrigeration crisis can present dire consequences to arestaurant, events venue or healthcare provider. Greater than the inconvenience of a breakdown is the responsibility to ensure that health and safety, quality and food laws are not neglected. You may save a little money by being ingenious and employing a happy-go-lucky approach, but it is never worth the risk; top-level services and excellent quality simply can’t be achieved with shortcuts. Efficient delivery of a cost-effective fridge trailer or cold room is essential to prevent costly wastage, delays and standards mismanagement. In a food environment it is obvious that stock will spoil or suffer from bacteria increases if not stored as necessary, for medical and scientific purposes, a lack of suitable refrigeration can make the difference between life and death. Substantial refrigeration space is required for blood drives and banks, to maintain sample quality and to store medications and vaccines, with the capacity to hold additional supplies during high-level epidemics. As on-site facilities seem to choose the most inappropriate times to develop a fault or breakdown completely, simply having the name and contact details for a leading emergency refrigeration services provider, with 24/7 availability and delivery in 2-4 hours,displayed prominently is prudent. It removes the need for searches online or in the phone book during the problem itself; these minutes are valuable so please don’t waste them. How much calmer would you be with the preparation done? Immediately dialling an emergency telephone number rather than trying to establish who does and who doesn’t offer 24/7 service and that their reputation and response times are good enough to safeguard your stock and operations. 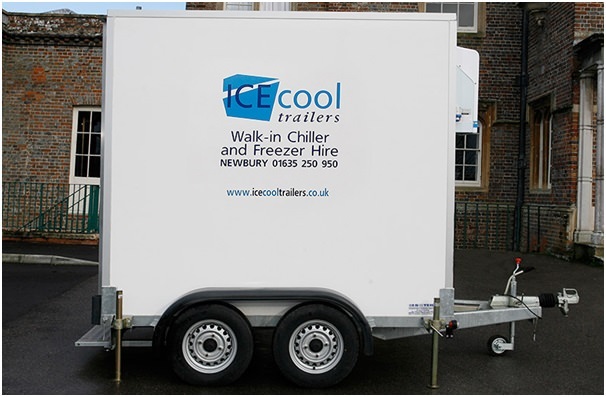 With over 25 years of experience supplying businesses with legislation meeting, hygienic and well maintained cold rooms and fridge trailers and their freezer equivalents, you can place your faith in Icecool Trailers, an industry leader. Based in Newbury, the company provides emergency refrigeration and pre-bookable facilities across a wide geographic area; from South Wales to London, Birmingham to Winchester, Bristol to Crawley;if you’re in the southern half of the country, they can come to your aid. Delivery of emergency refrigeration is 2-4 hours, dependant on the distances involved. Flexibility, even during a crisis. Emergency refrigeration facilities and cold room hire units are available in varying sizes and capacities. e.g. 1.8m, 2.4m and 3m. Fridge trailers are on wheels. They can be positioned exactly where they are needed. e.g. in a car park, side road, on a lawn, in a foyer, in an outbuilding. Units are powered via mains and generator. Fridge trailers can be relocated throughout the hire period for convenience. The client incurs no fuel expenses or time implications. The hire firm delivers and collects the facilities and sets them up ready for immediate use. Hire periods can be extended easily. Don’t panic when your refrigeration lets you down; there’s a proven solution provider primed to help you.